Usually i’m used to this tearing effect in all other Operation Systems like Linux and Windows. 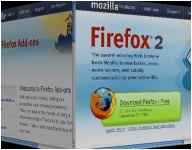 It is possible to enable vertical synchronisation all over the desktop environment but that slows down the whole system and results synchronisation problems in video playback. 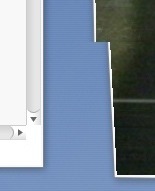 But in Mac OS X i noticed today something wierd. The tearing effect was gone. Totally smooth movement of the windows and the video playback was correct too. I don’t know how they do it, but it works. After dealing with my old 10.4.6 install with the “fake” 10.4.8 update which didn’t have the new 8.8.1 kernel I decided to make a complete new install. Got the JaS.10.4.8.AMD.Intel.SSE2.SSE3 – DVD and gave it a try. Right after installation I got massive Kernel panics about the Geforce.kext family. Tried to use the old ones from the backup directory, but didn’t have much success. After searching in a few forums and looking for help on macspeak network i decided to play with the boot options. I was able to get a 90 deg rotated display by starting with “Graphics Mode”=”1200x1920x32”. And as if I knew that its all my fault I just started with “Graphics Mode”=”1920×1200” (without bitdepth or refreshrate) and it worked like charm. CI (Core Image) and QE (Quartz Extreme) seem to work. I can play DVD’s and OpenGL stuff now. The nforce4 SATA support still isn’t implemented. I tried some mods for the AppleVIAATA.kext but no success yet, just a few system crashes. The only unsolved problem for me are these random crashes after like 30 mins usual working. Maybe its iTunes or Safari flash bug, no clue. Update: the random system crashes are gone, but i still don’t know what caused em. The only crashing applications so far were Qumana and the apple’s Preview. Next Update: you can easily make Qumana crash by just not assigning the blog post to a category. Well, if the glas is half filled, you could see it as a painful reminder and call it a “feature”. 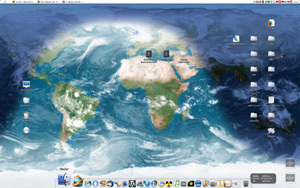 On my search for a new desktop background I stumbled across these Earth-Desktop-Tools like EarthDesk 3.5 (Win and OSX payware), Desktop Earth 2.1 ( Win freeware), OSXplanet (OSX freeware). EarthDesk 3.5 looks like the screenshot above. If you don’t use Active Desktop in Windows it will just generate a resulting image (map + cloud layer) and update your recent wallpaper. I wonder how long it can draw my attention until it gets boring and will be replaced.